I confess. I am a recovering comparer. I have been a comparer for the majority of my life. I've compared everything. My body. My house. My talent. My clothes. My situation. My role as a Mom. My spirituality. And yes, even my husband. 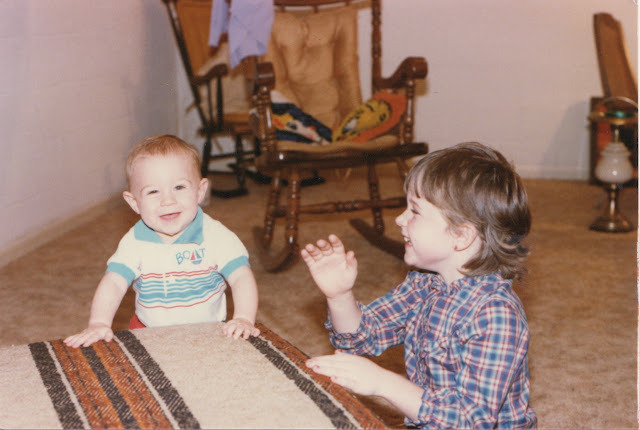 That's me on the right, at age 5, when the comparing began. I have spent hours making myself (and others around me) miserable because I wasn't as "skinny", "wealthy" or as "perfectly put together" as someone else. I have allowed my thoughts to fester into jealousy and have mentally "thrown in the towel" on hopes that I could ever be as "whatever" as someone else. What is it in us that wants so badly to be the best? My Mom used to say to me (often), "Brianne, there will always be somebody better [at something] than you. Somebody prettier. Somebody more athletic. Somebody richer." Talk about devastating. I was so appalled that my own Mother would crush my spirit with such terrible advice. I swore to myself that I would not be like her, but, daggumit, every time I say that, I eat my words. 1. I can not be the best at everything. I can only do my best at everything. There is a big difference. 3. We can sit around wishing we were a certain way or take small steps in becoming the person we want to be. 4. Write things down you are good at. Focus on using those gifts to help others. When we see the difference our gift makes, we are less likely to focus on things we aren't as good at. 5. Celebrate your individuality. Do things you love and enjoy. Don't spend all of your time looking at things you wish you could do. God has wired every person in unique ways. Enjoy being that unique person. 6. Everyone has struggles. Even the ones that seem to have it all together have "those" kind of days. 7. Learn from people you admire, but don't put them on a pedestal. 8. Everybody is different. Not just in looks, but in abilities. One person's "easy" is another person's "hard". 9. If you focus all of your energy into being like others, you will never be able to appreciate all that you already are. 10. Your worth is not in your abilities, but in that fact that you were fearfully and wonderfully made by a Creator who takes joy in knowing you. Turns out, my Mother may actually have known what she was talking about. And besides that, who wants to hang out with someone who is the best at everything? Imperfect people are way more fun. And I think I'm pretty fun to hang out with, if I do say so myself! Beautiful post Bri! A much needed encouragement. Loved #'s 2 and 8! Amen sister, Amen. Thanks!! Enjoy your vacation!! Can't wait to hear all about it! I love this post. I am a recovering comparer too. Thanks for the great perspective!! It's SO hard to stop. It's a daily thing for me, too. But, I am learning how to overcome it. Thanks for sharing!